In the business of selling cars, you’re always looking for a way to increase auto sales. You need to draw in potential customers to your lot, your website, your service; you want people to believe that your option is the best option for their needs and wants. Here are ten ways to increase auto sales on your lot. 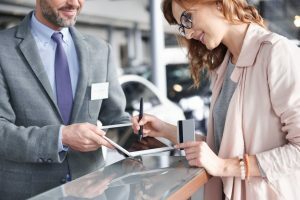 When preparing to buy a car (or anything!) the web is the first place people go. Google, social media, review sites—it’s the first level of research. You want people to find your site and your product over all others. Increased auto sales requires an investment in a coherent and connected online presence. Tap into your communities. This includes online groups but also the neighbourhood. Be present at your local chamber of commerce events. Talk to the people who are not only going to make purchases from you but will recommend your business to friends, family, and clients. When a friend says, “Hey, have you tried…” a person is more likely to have good feelings about the product or service being mentioned. That’s something you can leverage and continue to build on. Selling anything is about relationship building, and getting a foot in the door is imperative. Make it worth your clients’ while to share your name. Do you know how many clients you lost because they couldn’t find your phone number? Of course not—they never called! Make sure your contact information is easily available across platforms. Have an online appointment system for those who dislike phone calls. This works well with a blog. By becoming an expert in a specific area, you position yourself as a leader in that area, no matter how niche. This establishes credibility and trust with potential customers. If you’re plugged into the community and sharing quality content all the time, you’ll also be top of mind when it comes time to buy a new car. The reason you become an expert is to support your inbound marketing techniques. This is how you position yourself so interested clients come to you. When someone is looking for the car you sell, you want their searches, whether on social media, on search engines, or elsewhere, to bring them to you. Leverage that correctly and you can close the deal. Get to know the communities that are talking about the kind of product you sell. Don’t wade in there immediately and try to sell. Just show you’re a part of the community; share smart blogs on topics that matter to the community. Elevate other influencers. Build those relationships so people will come to you for purchases. Email is probably the second best marketing method. Everyone is still using email and will continue to do so for a long time yet. The trick is to only contact those who have shown an interest. Set up an opt-in listserv, and you’ll be spending your energy on crafting email campaigns for people who already have an interest in what you’re selling. Your website is your face to the digital world. It should be informative, attractive, but above all, simple. Don’t overload a potential client with information, but be sure to provide all the info they need/want. It’s a tricky balance, but it’s one you need to hit to draw people out of their homes and onto your lot. Your expertise is in selling cars. Find the support you need in reaching people online with professionals who have made that their business. The returns will be worth it. If you can successfully implement these ten suggestions, you’ll see greater auto sales.